Reger for guitar? The idea seems perverse at best, until you look closer at the program. It turns out that all of the works here are for solo violin or cello, and all are from the neo-Baroque end of Reger’s stylistic spectrum. 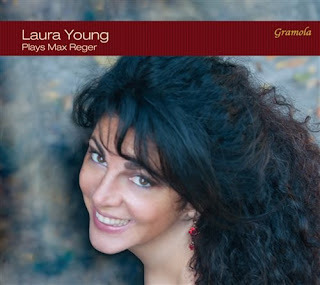 The results fit comfortably in the tradition of Bach cello suites arranged for guitar, and while the music is a bit more adventurous harmonically, guitarist Lara Young does a good job of convincing us that the music fits naturally under her fingers. Which isn’t to say it is easy. She her liner note, Young writes of the violin music “This is extraordinarily difficult technically because of the music’s density and content, which demand great commitment, energy and emotional expression from the performer.” That certainly characterizes her approach, and, unlike most violinists and cellists approaching this repertoire, Young makes no attempt to play this in a Baroque style. The guitar tone is full and round (as is the acoustic), phrases are broadly and liberally shaped, and a hint of vibrato is evident on the longer notes. As with Bach on the modern guitar, a case could be made for treating this as lute music, but that is not Young’s goal. Reger’s melodic lines are often longer and more chromatic than Bach’s, but Young has the nimble fingers and interpretive focus to bring them off. The preludes of the two violin preludes and fugues, opp. 117/3 and 131a/3, both benefit from her lightness of touch. Conversely, the fugues that follow in both works maintain their contrapuntal integrity thanks to her flowing legato lines. The other violin work, the First of the op. 42 Solo Sonatas, is more complex and not as strictly neo-Baroque. Here, Young must distinguish main melodic lines from accompaniments and subsidiary themes, which she does with excellent clarity. In all these works, the guitar’s ability to resonate longer than the violin benefits the voice-leading, although this must also be a result of Young’s careful control. It makes for a completely different character to this music though, much more modern, and occasionally jarringly Spanish, at least to my ear. The cello works that conclude the program, the First and Third Solo Suites from op. 131, pose different challenges. Reger often indulges in broad quadruple-stopped chords, and while these are more easily performed (presumably) on the cello, the effect is very different—real rather than suggested harmonies. On the other hand, Reger’s use of the gutsy tone of the cello’s lower strings transfers well to the guitar, and Young digs into bass lines, particularly in the finale of the First Suite, and the result has plenty of impact. She also achieves an impressive density of tone in the mid-register, for instance in the Third Variation of the Third Suite’s finale, and without compromising clarity of line. Technically, then, this recording is an impressive achievement. But as a listening experience, the whole enterprise is very distant from the original works. That is, of course, partly a result of the instrument substitution, but equally of Young’s interpretive approach, treating this as purely 20th-century music and playing down its debt to Bach. That can feel exploitative, but the performances all work on their own terms. More valuable as an addition to the guitar catalog, in other words, than as a new perspective on Reger.